If homeowners don’t want to mow lawns and plow snow, they usually live in a condominium or a townhome. But at The Torron Group’s Springfield Commons, those duties are performed by the Springfield Commons Homeowners Association while the homeowners reside in their own single-family homes and duplex carriage houses. “They own the lot, but the maintenance is provided for them in terms of snow and lawn care,” President Tom Songer explains. Bulk Internet service also is provided at a special rate. So far, 24 of Springfield Commons’ 67 homes have been completed, all with front porches, and clustered to leave 30 percent of the 22-acre development as open space. Six acres are permanent open space, and the rest of the open space is in residents’ front- and backyards. Springfield Commons is meant to be a traditional neighborhood design where residents know each other. The design of the homes is meant to complement historic Boalsburg, Pa., which is within walking distance of Springfield Commons. The homes range in size from 1,600 to 3,000 square feet. Knowing your neighbors is made easy at the community center, where residents can hold large gatherings of residents or families. Equipped with a full kitchen and fitness room, the community center is where Springfield Commons residents can meet with each other at community events or interact daily within the neighborhood throughout the year. Best of all, residence at Springfield Commons is not age-restricted, so empty-nesters, retirees and families with young children can mix together. The Pennsylvania State University in State College, Pa., is nearby, and the university holds many cultural and sporting events in the area along with continuing education opportunities. State College also is a hub for high-tech businesses that provide employment opportunities for an educated workforce. 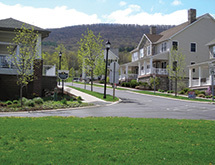 Another residential development by The Torron Group is Wiltree Condominiums, located in State College. The development’s attached townhouse units are two stories above grade with a basement that can be finished to total approximately 2,200 square feet. The three-bedroom units feature Energy Star appliances, gas heat and on-demand water heaters with a one-car garage. Only two buildings consisting of 15 units are left to complete in the development. The Torron Group also develops commercial office and light industrial buildings in the area. Songer estimates approximately 80 percent of the company’s revenue is from the commercial properties it builds and manages. The Torron Group’s developments utilize energy-efficient systems and design. Its homes are Energy Star-certified by EPA-approved raters, who inspect each house to make sure it meets Energy Star standards. The Torron Group is celebrating its 15th anniversary this year but has no special plans to commemorate it – “just stay the course and keep doing what we’ve been doing and strive for continuous improvement in what we do,” Songer says. For the future, Songer’s goal is to finish Springfield Commons and Wiltree Condominiums in a few years. “We’re looking for more opportunities, not so much in residential but more in the commercial field,” he says. “We’re starting to build a new 20,000-square-foot office building. We always consider buying a well-maintained office or light industrial building when the opportunity presents itself.